People are picky about the brands they follow on social media. Most audiences want to be entertained or educated – and even after users click the “Like” or “follow” button, they always have the ability to opt out. (Research shows that one in four will.) So why the effort to build a fanbase? What’s the lead value of a Like? For 78% of Americans, corporate social posts influence their buying decisions with organizations ranging from retail to financial consulting. Following a debt management company probably doesn’t sound entertaining to the average Facebooker, but one client proved any brand can have success on social media with a strategy that’s focused around giving people information they want to see. Host a Sweepstakes series with gift card giveaways to attract new followers and activate current followers. 50% increase in engagement, shares, impressions, and comments. To gain new followers, we created a sweepstakes strategy where our client gave away gift cards to fans, while encouraging them to share the contest with friends. Social contests are a format we recommend because research shows they have the highest form conversion rate of any format, at 35 percent. The first contest was a photo submission contest, where we asked users to submit a photo and brief explanation of it, alongside their information (name and email address). This contest received responses from just 13 percent of the existing fan base, and didn’t move the needle for new followers. Your fans don’t want to put in too much effort unless there’s a big reward. Asking users to submit photos with a description was “too big” of an ask for the prize we were giving. Make form fills ridiculously easy. The less information we require users to give, the more likely they are to fill out the form. For our second and third contests, we asked users to Like the Page then simply submit information through a short form fill. 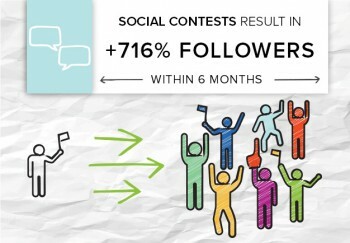 The sweepstakes boosted Page Likes as planned, and even after the contests ended, this client has enjoyed much stronger average page engagement among their followers than before.